House Republican Leader John Boehner (R-OH) today delivered the weekly Republican address. The address comes as unemployment rises while Washington Democrats continue to pursue policies on the economy, health care, energy, and the environment that will destroy more American jobs and drive future generations into deeper debt. The US lost over 2.5 million jobs in the first four months of this year under the Obama Administration. 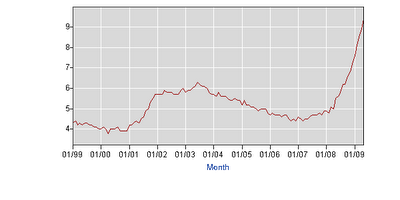 The US unemployment rate rose from 7.6% to 9.4% under Obama… the highest rate in 25 years. The US has lost 16,000 jobs each day since Democrats passed their non-Stimulus bill, the largest redistribution of wealth from the private sector to government officials in US history. Obama promised the Stimulus bill would bring down unemployment. The GOP point out the record job losses under the Obama Administration in weekly internet message. “The president and Democrats in Congress claim this spending binge is necessary to put Americans back to work,” House Republican leader John Boehner said Saturday in the Republican radio and Internet address. “They promised unemployment would not rise above 8 percent if their trillion-dollar stimulus was passed. The administration was wrong, Boehner said. “Unemployment has soared above 9 percent. And now the president admits that unemployment will soon reach double digits. “After all of this spending, after all of this borrowing from China, the Middle East, our children and our grandchildren, where are the jobs?” he said. Since President Barack Obama’s stimulus plan to trigger job creation was passed, the economy has shed 1.6 million jobs. The administration has focused instead on its estimate that the stimulus has created or saved 150,000 jobs. That estimate comes from a formula that uses government spending and tax cuts to predict job growth. The formula has been used by Republicans and Democrats alike, but was built to predict, not count jobs. To count jobs, economists traditionally rely on Labor Department data on unemployment, manufacturing and construction activity, and county-by-county, state-by-state job reports. White House spokesman Robert Gibbs said early this week that the president expects the nation will reach 10 percent unemployment within the next few months. In January, Obama’s economic team predicted unemployment would rise no higher than 8 percent with the help of a $787 billion stimulus program. The unemployment rate in May reached a 25-year high of 9.4 percent. Obama aides have said that the economy took a turn for the worse since their initial forecast.